Photo from Splash NewsBetty White is having quite a year, isn't she? Everywhere I turn -- TV, web, magazines, my dreams -- there she is. In commercials. Hosting SNL. In a new sitcom. There's even a push to get Betty to host the Oscars and/or the Emmys. You could say the woman has gone viral, but I'm not sure you want to allude to a virus when speaking of an almost-nonagenarian. At that age, every illness could be your last. So let's instead call it a resurgence, or at least a renewed appreciation. Whatever it is, it couldn't happen to a funnier gal. Betty White's been making people laugh for what, 50 years(? ), and has been on television continuously since the early 1970s. She frequently stole every scene she was in on The Mary Tyler Moore Show -- no small feat with that cast -- and held her own with recurring or guest parts on numerous other series like St. Elsewhere, Boston Legal, Empty Nest, and, of course, The Golden Girls. She even had her own series (though short-lived) in the late '70s. Go Betty. The sudden acclaim is well-earned. Perhaps it will start a trend among actors I grew up watching on TV, people who disappeared somewhere along the way, probably soon after they turned 40, which makes you an instant has-been in Hollywood. 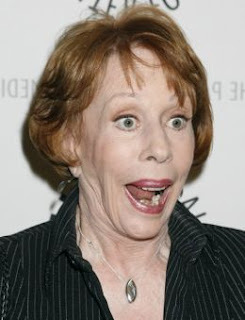 Carol Burnett, for example. Where's she been? I'd love to see her get reborn like Betty. Yes, Carol's gone a little scary with the plastic surgery, but I'm sure she's still hilarious. And Mary Tyler Moore. How come we never see her anymore? The list could go on and on: Melissa Gilbert, Lee Majors, Suzanne Somers, John Amos, Lori Loughlin, Lindsay Wagner, Pam Dawber, Marion Ross, William Katt, Sherman Hemsley, Barbara Eden, Sharon Gless, and so many more. I'd love to see even one of these TV staples of my youth get rediscovered like Betty. Sure, they'll turn up from time to time on infomercials or TV Land reunions, but no one's calling up Carol Burnett to host Saturday Night Live, and that's a shame. But at least we have Betty. I hope her resurgence lasts a long time.